While it’s hard to teach an old dog a new trick, refreshing an adult dog’s housetraining skills is an easier trick than most. According to famous dog behaviorist Cesar Millan, it’s important to first distinguish that your adult dog’s in-house accidents are not the result of behavioral or medical issues, but simply a lack of training.1 He suggests contacting your vet if you suspect the soiling is related to medical problems, and consulting a canine professional if the soiling is related to a behavioral problems. Otherwise, training to the rescue! When it comes to housebreaking your dog, crate training is recommended by more veterinarians than any other method. 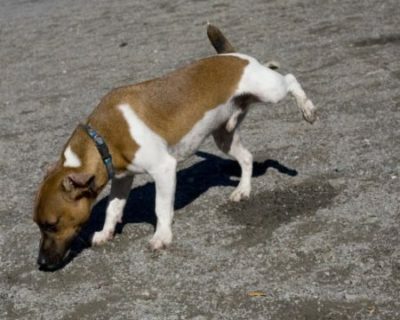 The basic reason for this is that dogs usually will not soil in areas where they sleep. For this reason, it’s important to get a crate that is just big enough to be a bed. Your dog should be able to to stand up, turn around, and lay down, but nothing more. This will eliminate the temptation for him to soil in the corner of the crate and miss out on the point of the training. For adult dogs, create training will only need to be used short-term, until the dog is safely housetrained. For puppies, the process is a bit longer. Start using the crate the day you bring your puppy home, until he can successfully eliminate outside regularly. Crate training does not mean your dog is cooped up and alone all day. Keep your dog’s crate in an area where you spend a lot of your time, so he won’t feel isolated. Give him lots of time outside the crate to exercise, play, and bond with you (a great time to do this is right after he has successfully eliminated). It’s important not to confine your dog in his crate for longer than he can hold it. When he goes outside to “do his business” make an effort to revisit the same spot each time to build routine. One of the biggest mistakes dog owners make when housetraining their pet is to punish them long after the mistake has occurred. According to Drs. Foster and Smith of Pet Education, the number one rule of house training is, “If you do not catch your puppy doing it, then do not punish him for it!”2 Dogs, especially puppies, have short-term memories. Unless you catch the dog in the act, he will have no idea why you are scolding him. In these instances it’s best to simply clean it up and move on. When you do catch him in eliminating in the house, startle (don’t scare!) him with a clap to stop him in the process and take him outside immediately. In the end, consistency is the key to success. You should reward your dog profusely each time he does the right thing in the right place. Punishing your dog for mistakes can actually make housetraining harder, and cause him to simply hide from you each time he goes in the house. When mistake do occur indoors, make sure to clean the soiled area thoroughly, as dogs tend to continue soiling in the same area based on smell.